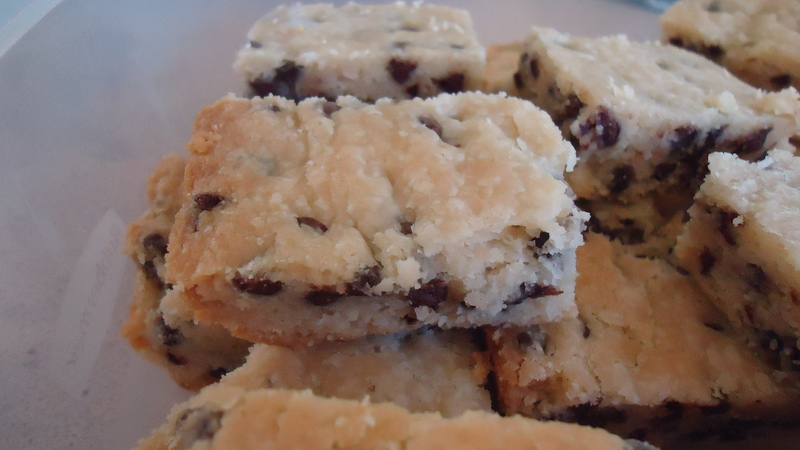 You’d think that someone who isn’t eating sweets for four months wouldn’t torture herself by baking flaky, buttery shortbread studded with miniature semisweet chocolate chips. And yet. This recipe is an adaptation, in both ingredients and process. The original recipe called for dried cranberries instead of chocolate chips, mixing the dough with a spoon, and then, to my great shock, cutting the finished product into heart shapes and discarding the remaining scraps. Since I had some miniature chocolate chips on hand, I easily substituted those for the cranberries, and I found that rubbing the butter into the dry ingredients with my hands was far easier than using a spoon. As for discarding the remaining scraps, well, only someone who isn’t in their right mind would waste perfectly good shortbread. Just a few tips for this recipe: you want your butter to be at room temperature, but not too soft. The flour and powdered sugar should be sifted before measuring, which is why this isn’t written “3/4 cup powdered sugar, sifted.” And while using your hands will be messy, it will also be infinitely easier than trying to stir the dough together with a spoon. In a large bowl, combine butter, powdered sugar, flour, vanilla, and salt. Using your hands, rub the butter into the dry ingredients until a well-combined and soft dough forms. Add chocolate chips and, again using your hands, incorporate them into the dough. Press the dough evenly into an 8 x 8 baking dish. Bake for 30-35 minutes, until firm and pale golden. Invert pan onto a cutting board and cut into squares.